Do you want your skin to have that silky, smooth, waxed feel without paying spa prices? If so, and your pain threshold is decent, the Emjoi AP-18 Emagine Dual Opposed 72 Tweezer Head Epilator is a great investment. I got mine a few months ago, because I found waxing at home to be too tedious and messy. If you’re unsure of what an epilator is: imagine an electric razor, and then replace the blades with little tweezers. The tweezers rapidly pluck the hair off the surface of your skin–something that can be very unpleasant at first, but you will get used to over time. I have used my epilator consistently on my underarms, forearms, and even sensitive areas like the face. Pros: The Epilator makes life simpler for people who just don’t have the time or patience to wax. 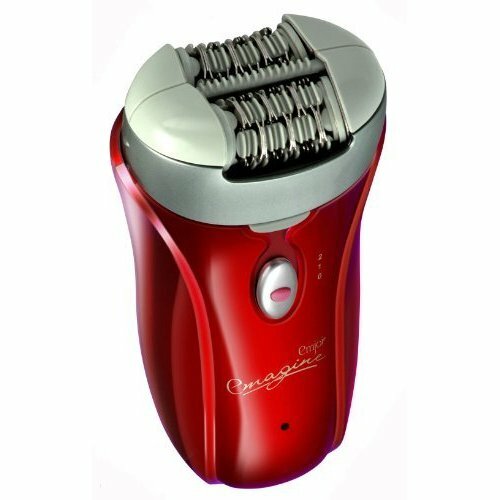 The dual motors and 72 tweezers built into the Emjoi AP-18 Emagine Dual Opposed 72 Tweezer Head Epilator create a quick hair-removing process. Waxing or using the epilator is beneficial for area that have unwanted in-grown hairs, like the arm pits. The epilator is easy to clean: the hair can be wiped out with the brush provided, and the head can be removed and soaked in soapy water for a deeper cleaning. The Emjoi AP-18 Emagine Dual Opposed 72 Tweezer Head Epilator comes with a travel case, to make your hair removal needs easier on trips and vacations. The epilator costs around $80 at most retail stores. The price is worth it if you will spend more than this amount on waxing at home or in salons. Tweezing may be painful, and you may cut your skin if you do not exfoliate the surface before attempting to pass over it with the Emjoi AP-18 Emagine Dual Opposed 72 Tweezer Head Epilator. You may experience redness for a short time after using the epilator. It goes away on its own, but may be helped along by an ice pack if necessary. The Bottom Line: If you have waxing needs or embarrassing facial hair that you are constantly waxing or threading to get rid of, the Emjoi AP-18 Emagine Dual Opposed 72 Tweezer Head Epilator can assist you with your hair removal needs. There are many epilators to choose from, but Emjoi is the only brand that currently makes an epilator with 72 tweezers, other models have less. The 72 tweezers make removing hair a faster process, and there are two speed setting to choose from, if the high speed is too intense. I have used my epilator enough in a few short months to justify its purchase. If you spend money on waxing salons frequently, the Emjoi AP-18 Emagine Dual Opposed 72 Tweezer Head Epilator is definitely worth the money.